The cafe, at 5507 N. Clark St., plans to open in mid-February, the owner said. ANDERSONVILLE — Andy Peters' careers at Chicago Gourmet and the Illinois Restaurant Association led him to dream of opening a "cafe that I wanted to go to" in his neighborhood: Andersonville. 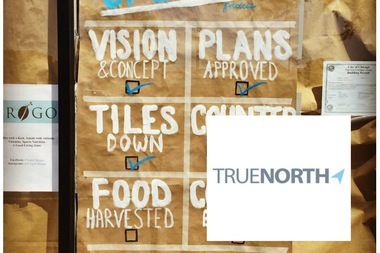 Now he's just weeks away from reaching the aspiration when his quick service cafe, True North, opens at 5507 N. Clark St. in mid-February. "I saw many food and coffee trends that really excited me. Chefs are getting really good at making healthy meals that are also delicious and filling," he said. Co-owners Peters and Scott Dicker met a couple years ago on a birthright trip in Israel. At the time, the young entrepreneurs were both pursuing careers that revolved around food and healthy living. "We didn't feel like there's any place where you can get a quick, healthy and affordable meal [here]. You can get a quick meal and it'll be unhealthy, or you can get a healthy meal, but it'll be expensive and sit-down," Dicker said. Originally, the cafe, which will also offer vitamins and supplements, was to be named Progo. It was expected to be open in August 2015. Dicker, who studied nutritional science and dietetics at the University of Arizona, said ever since The Vitamin Shoppe at Foster and Clark avenues closed, there has been nowhere to buy supplements in Andersonville. "We want to make sure that when you go in and ask a question, you're asking someone who knows what they're talking about," Dicker said. Recently, the owners changed the name to True North because it perfectly reflects "the menu, interior design, and location of the cafe," Peters said. "The name related to the menu in that I feel like our dishes are filled with real food. It is simple and nutritious, but most importantly it is delicious," he said adding options will include vegan, gluten-free options and locally sourced "salads with attitude." "Our chef created some great salads that can also be made into wraps. I do not consider myself a big fan or sriracha, but he created a salad using a soy sriracha-marinated chicken breast and a cool lime yogurt dressing, which may have been the best salad I have ever had," he said. While the name also reflects its location on the North Side of Andersonville, a North Side neighborhood, it also represents the interior design of the cafe, which incorporates maps and geography. "True north is different than magnetic north in that it never wanders or varies from place to place like magnetic north. True north, unlike magnetic north, is non-negotiable, which in some ways makes it feel more real," he said. For the design, Peters collaborated with the owner of Scout, at 5221 N. Clark St., Larry Vodak. "He taught me a lot about design. Not only did I source as much furniture from him as possible, I was calling him up or meeting with him almost daily for advice and wisdom," he said. "[Vodak] helped us accomplish something really cool that incorporates many elements of geography and the outdoors. We have an entire wall of globes, which I swear is cooler than it sounds."